It’s been ten years since the launch of the first interactive open access journal Atmospheric Chemistry and Physics, followed by a growing number of EGU open access journals covering most fields of geoscience. A combination of traditional peer review and interactive and public discussion on the internet assures efficient scientific exchange and top quality. High submission rates and impact factors confirm the high value and visibility of the publications, which continue to grow rapidly. To celebrate the success and achievements of the EGU open access journals, the EGU publications committee and journal editors would like to invite you all to have a drink at the reception tonight! The reception will be held Tuesday 5 Apr, 19:00, Foyer E (Yellow Level – Ground Floor). Further information about (interactive) open access publishing at EGU can be found online. 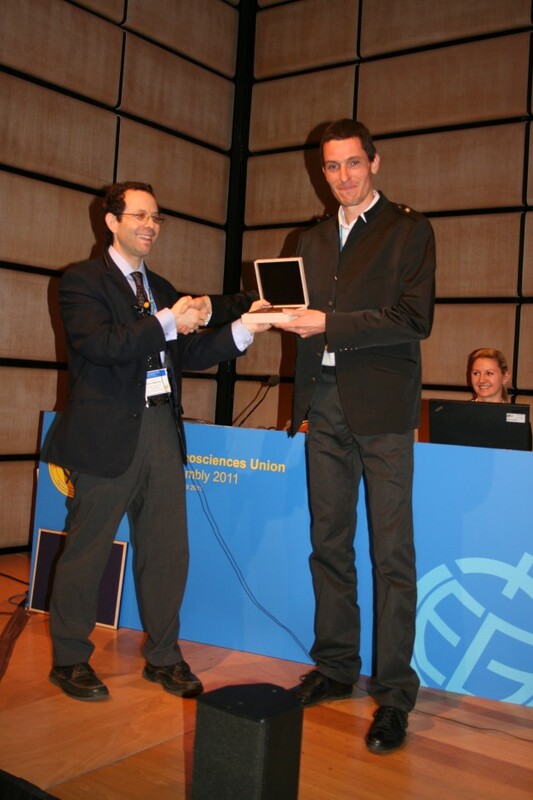 The Plinius Medal is presented to Raphaël Paris in recognition and appreciation of his outstanding contributions to multidisciplinary research in the field of natural hazards and risk mitigation, with special focus on volcanic hazard, on volcanic slope instabilities, of tsunamigenic eruptive and gravitational processes, and on studies of tsunami onshore deposits. Have you visited the Job and Education Market at EGU GA 2011? Please remember that the Job and Education Market is not just for young scientists, but for experienced professionals too. Some companies exhibiting are actively looking for mid-career scientists. Some mac users have been experiencing problems with the USB stick that contains the European Geosciences Union General Assembly 2011 Programme. If you have been affected, please take the USB to the EGU Information Desk (Ground Floor, Yellow Level, to the left once you get in the main entrance) and the problem can be resolved in 5-10 seconds. All student assistants have been instructed on how to resolve the issue. This is a problem that has been an issue with some mac users, there are no reported issues with PC users.